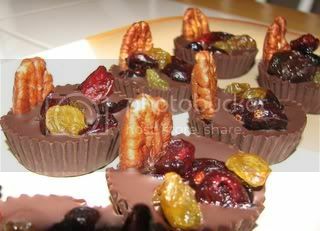 They are like having super chocolately covered fruit with toasted nuts – SO GOOD! Ok, back to The Bachelor Finale…..See you all tomorrow. These look so good. It looks like the perfect after-dinner treat. I’ve been meaning to make this recipe since I saw it in “Vegetarian Times,” but I kept thinking it would be too much work (and too rough on my waistline, too!). I’m glad to hear that it was simple to make, and I love the picture, it’s scrumptious! Kirwin ~ They are awesome and believe it or not, one is totally satisfying. It is worth the 88 calories. Definitely make sure to toast the pecans first because it makes a huge difference in flavor.